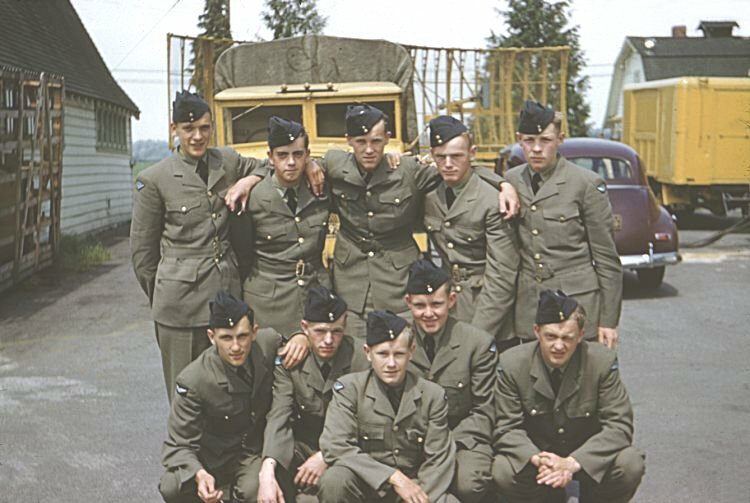 2442 Aircraft Control & Warning & Unit (Reserve) Vancouver was formed on 1 April 1950 to train personnel in radar operations for the new radar stations then under construction as well as to train these same personnel in all aspects of aircraft control and warning. 2442 AC&WU reported to No. 5 Air Division at Vancouver. On 1 November 1951, 2442 AC&WU was re-designated as 2442 Aircraft Control & Warning Unit (Auxiliary), and on 1 December 1953, the unit became a squadron. Some of the Regular AC&W Squadrons that unit personnel were deployed and employed at included Holberg, Baldy Highes, Kamloops and Blaine Washington. The unit personnel worked hand in hand with their Regular counterparts from both the RCAF and USAF. Narrative reports on the Pinetree Line web site confirm that 2442 AC&W Squadron was active at Kamloops Air Station, Kamloops BC in 1960 and RCAF Station Lac St. Denis in 1952. 2442 AC&W Squadron was yet another victim of the SAGE system. Consequently, on 31 March 1961, the Squadron was disbanded. 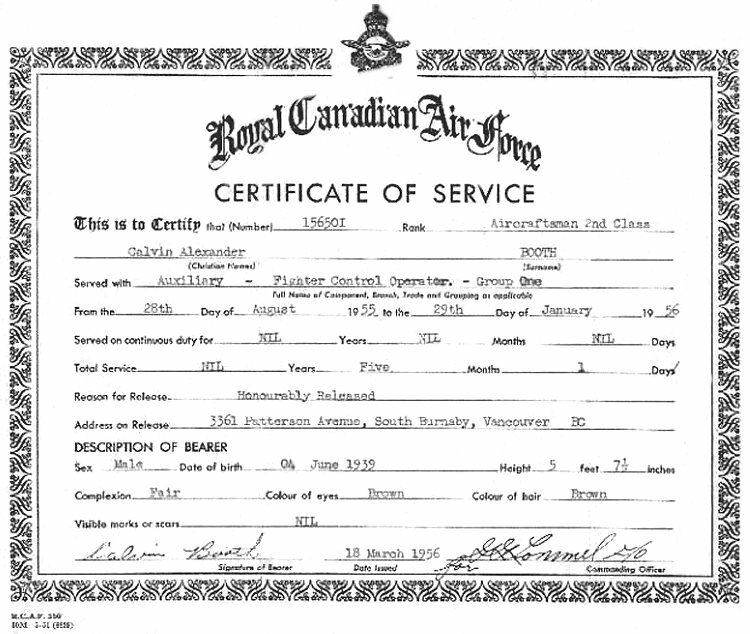 Certificate of Service issued when 2442 AC&W Squadron was closed down - 31 January 1961. Cutlines - 2 February 1961. Disbandment Parade - 22 January 1961. 2442 AC&W Squadron History - January 1961. Historical Narrative - 1 November 1960 to 31 March 1961. Organization Order R2.0.17 - 3 October 1960. 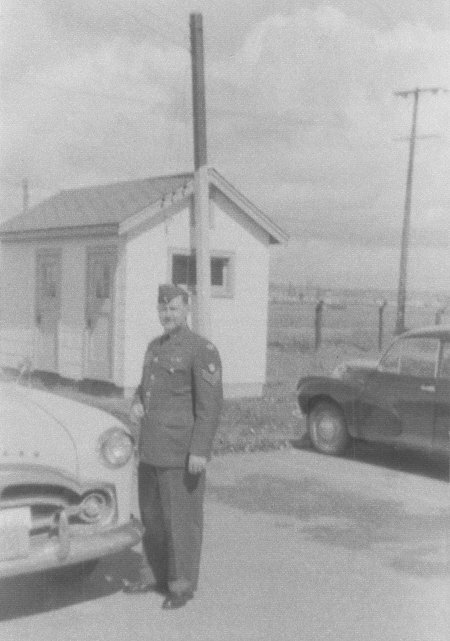 Ron Mutch in the USAF manned radar station at Kamloops - July 1960 . 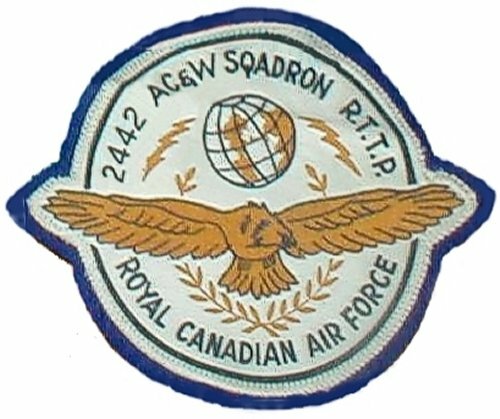 2442 AC&W Squadron crest - July 1959 . 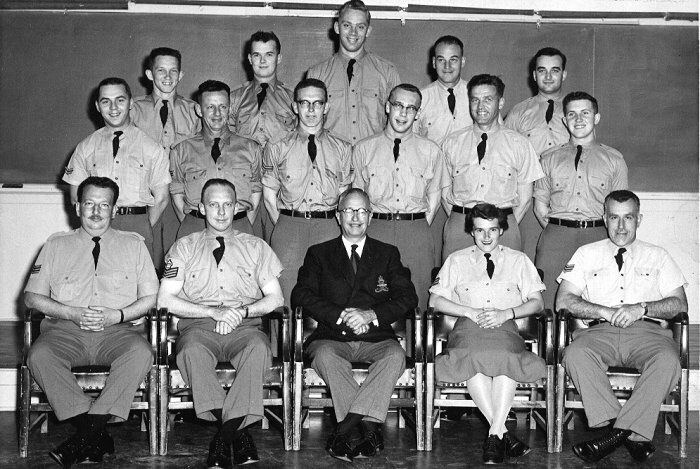 Reserve Tradesman Training Plan (RTTP) trainees - July 1959 . 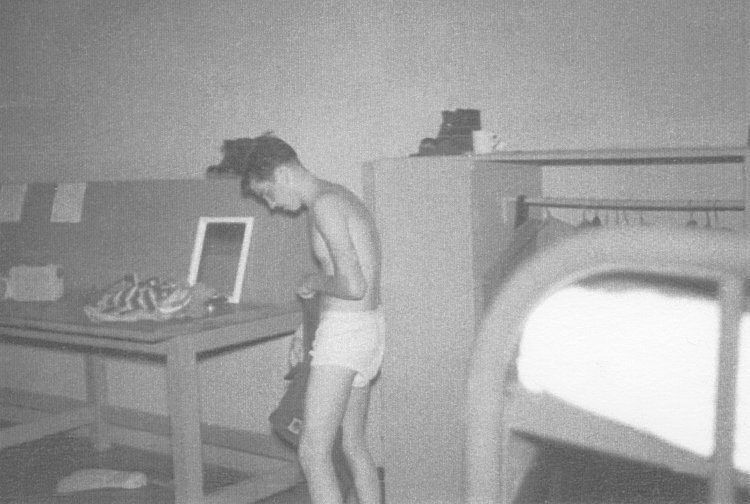 Close up photo of Reserve Tradesman Training Plan (RTTP) trainees - July 1959 . Organization Order R3.0.19.3 - 1 June 1958. 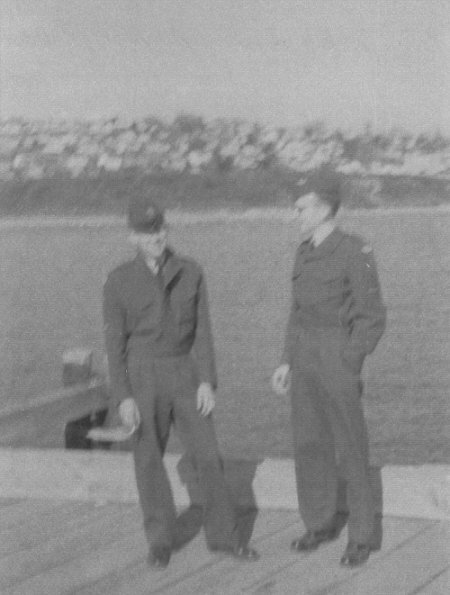 (L-R) - LACs Ron Mutch and Jim Kazemir at an unidentified location - 1958. FS Nick Williamson, west of Sherwood Barn, in front of his Packard - 1958. Sherwood Barn was and located on the north east corner of the airport which is now south of the main road into the airport. 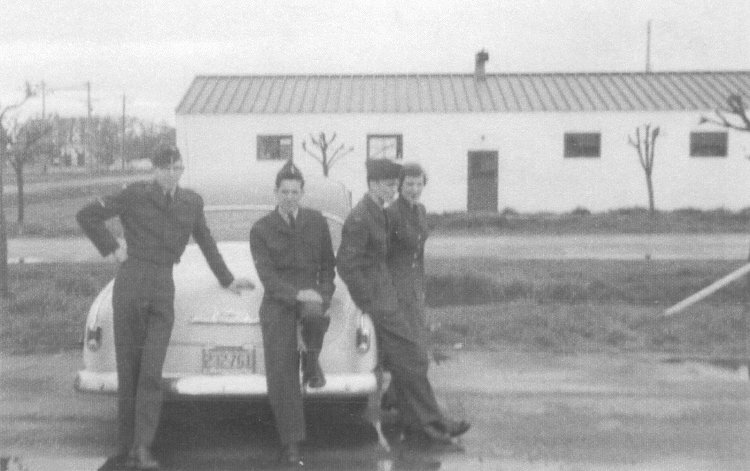 Squadron personnel by Bill Galovich's 52 Chev in the parking lot west of Sherwood Barn - 1958. (L-R) - Herb Barge, Ron Mutch, Jim Kazemir, Joyce Palmer. SIT Course held in Trenton with 2442 AC&W Squadron personnel. Herb Barge, middle row - 3rd from left, middle row. Bob McBean - back row, 1st left, and Ron Juriet - back row, 3rd from left - October 1957. 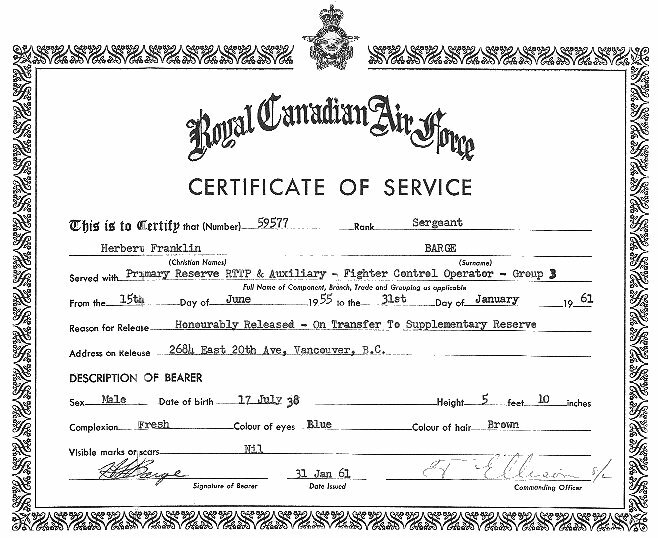 Certificate of Service - 18 March 1956. Organization Order R3.0.19.3 - 28 December 1954. 2442 AC&W Squadron personnel in front of AMES-11C mobile radar equipment - July 1954. Organization Order 88/53 - 23 November 1953. Organization Order 14/52 - 26 March 1952.